This actually was quite exciting. Hopefully there will be a nice day for photos, so I can show the results. Clay tile carving, a photo by rjknits on Flickr. 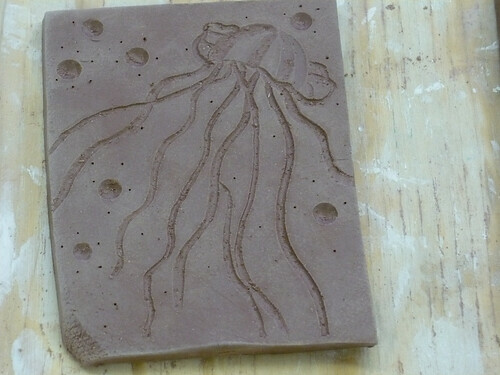 Air-dried clay tile with a carving of a stylized jellyfish. This is part of my terra sig work. 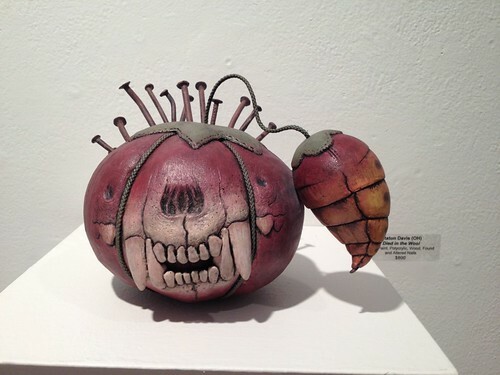 It’s currently in the electric kiln to be bisqued. I did put blue sig on it before it went to bisque. Later on in the week it goes to the pit firing, and we’ll see if the blue sig stays on.